NISA's Tips & Tricks: Touhou Genso Rondo Bullet Ballet (Part 6) | NIS America, Inc. 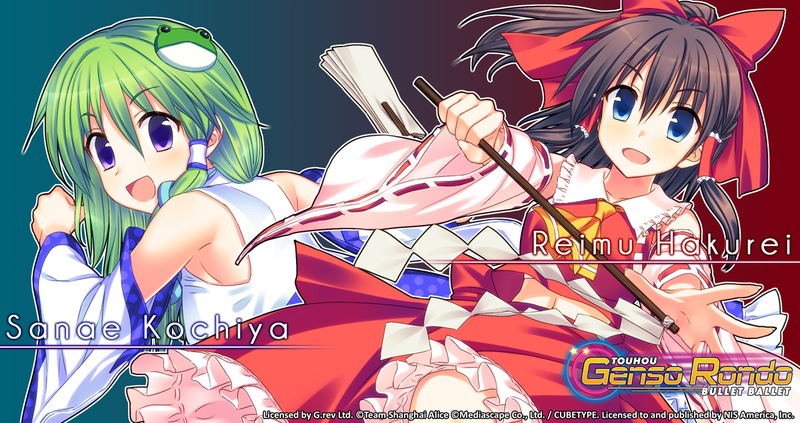 Welcome to our final installment of NISA's Tips &Tricks for Touhou Genso Rondo: Bullet Ballet! I'm Steven Carlton, the editor for Touhou Genso Rondo, and it is my privilege to present the final two characters, Reimu Hakurei and Sanae Kochiya, and give you a little insight into what strategies I've found to be effective. And for more tips about the girls of Touhou Genso Rondo, check out the previous installments by Robbie, Jupy, Jordan, Chris, and Roggie! Now, let's take a closer look at each of these fine shrine maidens. Bio: The shrine maiden of Hakurei Shrine, who treats both humans and yokais equally. Actually, she's equally indifferent to both humans and yokais. She has very standard stats, but her various barrier skills allow her to excel in taking control of the area. Reimu launches two orbs in front of her that can block the opponent's attacks and generate P Items when they get hit. Since the orbs don't travel too far, Reimu is more likely to benefit from these P Items than her opponent. Reimu shoots two homing bullets in the shape of talismans. They move pretty quickly and maneuver pretty well, making them harder to avoid than most attacks. Reimu fires a burst of colorful homing bullets all around her. The talismans will home for a particularly long time, adding to the chance that they may hit while she's free to move on to other attacks. Reimu launches two orbs that flank the opponent and fire at them from the side while she's free to fire at them directly. Reimu launches four orbs that flank the opponent and fire bullets that set up a perimeter around them, restricting their movement while she can fire straight at them. Reimu excels at boxing her opponent in and forcing them to either take her attacks while restricted to a confined space, or leave the confined space and take the hits to get out. She also utilizes plenty of homing attacks to reflect her lazy attitude. Bio: The shrine maiden of the Moriya Shrine on Yokai Mountain, who recently moved to Gensokyo. She tends to be a little absent-minded. Said to be a living god, she has an abundant number of attacks. Sanae fires four streams of bullets, two directly in front of her, and two that shoot out wider. This attack offers a nice double-wide attack to the front, and the two outer streams are good for keeping the opponent contained if they do manage to dodge the frontal assault. Sanae release a couple of frogs that explode. This attack has a pretty short range, but it can create a pretty wide barrier to keep the opponent from rushing in. Sanae unleashes bullets in star patterns around her that eventually disperse across the entire area. It challenges the opponent to put their bullet hell skills to the test or face the consequences. Sanae releases four snakes that home in on the opponent. They move pretty fast, and are quite maneuverable, but they start out by flanking out to the sides, so it can take some time for them to reach their target. Sanae unleashes three spear-like bullets that bloom into snowflake-like patterns that form a large barrier before dispersing into streams of bullets that spread out in every direction. Sanae relies heavily on two tactics: letting her attacks chase her opponent around, or giving her opponent nowhere to run by attacking everywhere. I must say, those are two great tactics. Well, that about does it for me. I hope you all enjoyed our insights into the characters of Touhou Genso Rondo: Bullet Ballet, and try them out for yourselves. Will they work for your style of gameplay? Find out when the game comes out next week on Tuesday in North America and Friday in Europe! You can still preorder your copy from GameStop, Amazon, and our very own NISA Online Store!